Enter Mount Massive Asylum: a deranged playground of psychotic mental patients run amok. You are Miles Upshur, a freelance journalist with more balls than a 90s McDonalds play place. After receiving an anonymous tip that there might be something very wrong going on at Mount Massive, you decide to go investigate for yourself. Armed with nothing more than your trusty camcorder and a notebook, you find your way into the asylum via broken window. That’s when things really go wrong. 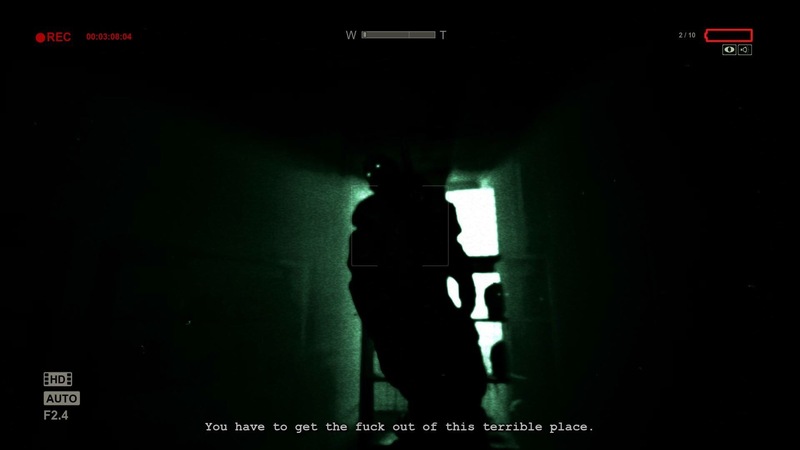 Outlast wastes no time throwing you into the hellish chaos inside the asylum, and from there the game goes at an almost unstoppable pace, like blood gushing from a loose tourniquet. Miles constantly writes in his notebook, giving the player insights into his perspective of the horror. His notes add a very small but very needed level of comic relief to the game, as you survive each terrifying encounter only to have the ballsy protagonist write down a quick quip about what was just witnessed. It’s a welcome break from the seemingly unescapable darkness that goes on over the course of the game. Outlast is literally drenched in darkness. 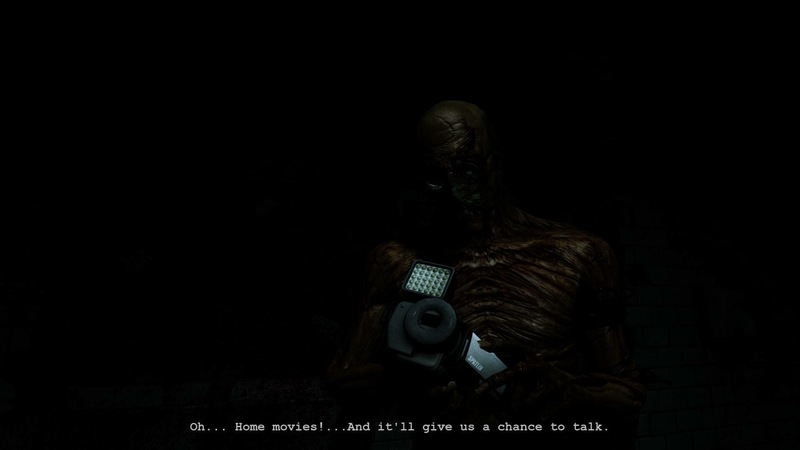 For light, Miles uses the night vision of his handy cam, and it does do a great job of helping you see the horror, but it’s limited by the camera’s battery life. Batteries are thankfully scattered around the asylum in obvious places (on top of desks and dusty shelves), and searching for them is actually an element of the game that I really enjoyed. Searching for batteries led me to see more than a few eerie sights that I would have missed had I not been in deathly need of more juice for my main source of light. With hands glued to his camera, Miles has no way to defend himself from the aberrations that wander the halls, leaving you no choice but to outrun your foes or find a place to hide (most often in an empty locker or underneath a bed). Closing doors on your enemies will slow them down, but after a few seconds of smashing and crashing, they come charging through, more blood crazed than before. Having to improvise a hiding spot or escape route during a chase gets the adrenaline pumping, especially when some of the enemies rip open locker doors in an attempt to find that next piece of meat—you. 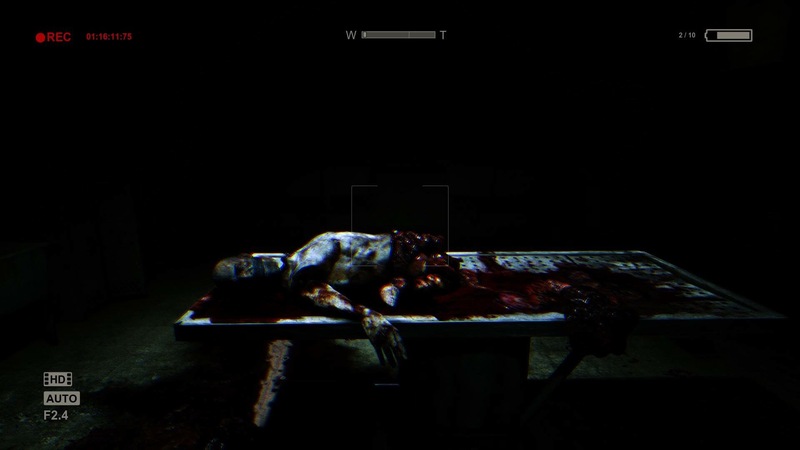 Although each is scary, there are only a few enemy types in Outlast. The usual creep is an insane patient, armed with a surgical tool or a hatchet. But occasionally you are stalked by a much larger inmate who seems to have a fetish for ripping the heads off of his victims. These sequences are intense the first few times, but once you get used to them, they are more of an annoying obstacle in the way of the next exciting set piece, one of the best of which puts you at the mercy of a deranged doctor. In between set pieces, Outlast tends to bog down, forcing you to stop cold in your tracks and do some monotonous task, like finding fuses for a fuse box, or searching for water valves. Outlast is also short, clocking in at roughly four hours on my first play though. I can’t see myself being able to handle much more of the game’s anxiety, but the fact that a bulk of my four hours was spent doing dilly-dally objectives was a letdown. Past the tedium, the story in Outlast slowly dips into supernatural mystery. As the player, you are kept in the dark until the close final moments of the game. The only knowledge about the story is gained through Miles’ notebook, bloody writings on the walls, scattered documents left by old staff members, and a self-appointed priest who serves as your suspicious and unpredictable guide to escaping Mount Massive. It’s a design decision that I gladly welcome, immersing you in Miles’ character the whole way. Outlast is visceral, scary, and a breath of fresh air into the survival horror genre. It has a style that’s inspired by a familiar chunk of horror movies, but that still manages to feel completely new and fresh. Save for a few low points in level design, I had a blast playing Outlast, and I eagerly await the recently announced second installment. Turn the lights out, grab your headphones, and enjoy one of the best horror games in recent history. Brian Beaton is a film/ game fanatic. He specializes in the horror genre, and has spent countless hours and many sleepless nights researching the craft and design of the genre.